“We must ask about this right away.” He rang the bell and asked Barrymore whether he could account for our experience. It seemed to me that the pallid features of the butler turned a shade paler still as he listened to his master’s question. And yet he lied as he said it, for it chanced that after breakfast I met Mrs. Barrymore in the long corridor with the sun full upon her face. She was a large, impassive, heavy-featured woman with a stern set expression of mouth. But her telltale eyes were red and glanced at me from between swollen lids. It was she, then, who wept in the night, and if she did so her husband must know it. Yet he had taken the obvious risk of discovery in declaring that it was not so. Why had he done this? And why did she weep so bitterly? Already round this pale-faced, handsome, black-bearded man there was gathering an atmosphere of mystery and of gloom. It was he who had been the first to discover the body of Sir Charles, and we had only his word for all the circumstances which led up to the old man’s death. Was it possible that it was Barrymore, after all, whom we had seen in the cab in Regent Street? The beard might well have been the same. The cabman had described a somewhat shorter man, but such an impression might easily have been erroneous. How could I settle the point forever? Obviously the first thing to do was to see the Grimpen postmaster and find whether the test telegram had really been placed in Barrymore’s own hands. Be the answer what it might, I should at least have something to report to Sherlock Holmes. “Well, surely his own wife ought to know where he is,” said the postmaster testily. “Didn’t he get the telegram? If there is any mistake it is for Mr. Barrymore himself to complain.” It seemed hopeless to pursue the inquiry any farther, but it was clear that in spite of Holmes’s ruse we had no proof that Barrymore had not been in London all the time. Suppose that it were so — suppose that the same man had been the last who had seen Sir Charles alive, and the first to dog the new heir when he returned to England. What then? Was he the agent of others or had he some sinister design of his own? What interest could he have in persecuting the Baskerville family? I thought of the strange warning clipped out of the leading article of the Times. Was that his work or was it possibly the doing of someone who was bent upon counteracting his schemes? The only conceivable motive was that which had been suggested by Sir Henry, that if the family could be scared away a comfortable and permanent home would be secured for the Barrymores. But surely such an explanation as that would be quite inadequate to account for the deep and subtle scheming which seemed to be weaving an invisible net round the young baronet. Holmes himself had said that no more complex case had come to him in all the long series of his sensational investigations. I prayed, as I walked back along the gray, lonely road, that my friend might soon be freed from his preoccupations and able to come down to take this heavy burden of responsibility from my shoulders. The words took away my breath for an instant but a glance at the placid face and steadfast eyes of my companion showed that no surprise was intended. My first thought was that I should be by Sir Henry’s side. But then I remembered the pile of papers and bills with which his study table was littered. It was certain that I could not help with those. 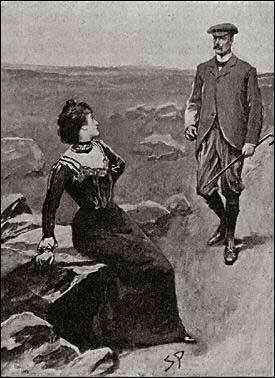 And Holmes had expressly said that I should study the neighbours upon the moor. I accepted Stapleton’s invitation, and we turned together down the path. “That is the great Grimpen Mire,” said he. “A false step yonder means death to man or beast. Only yesterday I saw one of the moor ponies wander into it. He never came out. I saw his head for quite a long time craning out of the bog-hole, but it sucked him down at last. Even in dry seasons it is a danger to cross it, but after these autumn rains it is an awful place. And yet I can find my way to the very heart of it and return alive. By George, there is another of those miserable ponies!” Something brown was rolling and tossing among the green sedges. Then a long, agonized, writhing neck shot upward and a dreadful cry echoed over the moor. It turned me cold with horror, but my companion’s nerves seemed to be stronger than mine. “Halloa!” I cried. “What is that?” A long, low moan, indescribably sad, swept over the moor. It filled the whole air, and yet it was impossible to say whence it came. From a dull murmur it swelled into a deep roar, and then sank back into a melancholy, throbbing murmur once again. Stapleton looked at me with a curious expression in his face. “Queer place, the moor!” said he. “No, they are the homes of our worthy ancestors. Prehistoric man lived thickly on the moor, and as no one in particular has lived there since, we find all his little arrangements exactly as he left them. These are his wigwams with the roofs off. You can even see his hearth and his couch if you have the curiosity to go inside. A small fly or moth had fluttered across our path, and in an instant Stapleton was rushing with extraordinary energy and speed in pursuit of it. To my dismay the creature flew straight for the great mire, and my acquaintance never paused for an instant, bounding from tuft to tuft behind it, his green net waving in the air. His gray clothes and jerky, zigzag, irregular progress made him not unlike some huge moth himself. I was standing watching his pursuit with a mixture of admiration for his extraordinary activity and fear lest he should lose his footing in the treacherous mire when I heard the sound of steps and, turning round, found a woman near me upon the path. She had come from the direction in which the plume of smoke indicated the position of Merripit House, but the dip of the moor had hid her until she was quite close. I could not doubt that this was the Miss Stapleton of whom I had been told, since ladies of any sort must be few upon the moor, and I remembered that I had heard someone describe her as being a beauty. The woman who approached me was certainly that, and of a most uncommon type. There could not have been a greater contrast between brother and sister, for Stapleton was neutral tinted, with light hair and gray eyes, while she was darker than any brunette whom I have seen in England — slim, elegant, and tall. She had a proud, finely cut face, so regular that it might have seemed impassive were it not for the sensitive mouth and the beautiful dark, eager eyes. With her perfect figure and elegant dress she was, indeed, a strange apparition upon a lonely moorland path. Her eyes were on her brother as I turned, and then she quickened her pace towards me. I had raised my hat and was about to make some explanatory remark when her own words turned all my thoughts into a new channel. I could only stare at her in stupid surprise. Her eyes blazed at me, and she tapped the ground impatiently with her foot. “Why should I go back?” I asked. “Halloa, Beryl!” said he, and it seemed to me that the tone of his greeting was not altogether a cordial one. “Yes, I was chasing a Cyclopides. He is very rare and seldom found in the late autumn. What a pity that I should have missed him!” He spoke unconcernedly, but his small light eyes glanced incessantly from the girl to me. A flush of vexation passed over her expressive face. “We have been talking at cross purposes,” said she. “Why, you had not very much time for talk,” her brother remarked with the same questioning eyes. “Quite happy,” said she, but there was no ring of conviction in her words. It seems, however, that there must have been some short cut for those who knew it, for before I had reached the road I was astounded to see Miss Stapleton sitting upon a rock by the side of the track. Her face was beautifully flushed with her exertions and she held her hand to her side. An expression of irresolution passed for an instant over her face, but her eyes had hardened again when she answered me. “You make too much of it, Dr. Watson,” said she. “My brother and I were very much shocked by the death of Sir Charles. We knew him very intimately, for his favourite walk was over the moor to our house. He was deeply impressed with the curse which hung over the family, and when this tragedy came I naturally felt that there must be some grounds for the fears which he had expressed. I was distressed therefore when another member of the family came down to live here, and I felt that he should be warned of the danger which he will run. That was all which I intended to convey. “My brother is very anxious to have the Hall inhabited, for he thinks it is for the good of the poor folk upon the moor. He would be very angry if he knew that I have said anything which might induce Sir Henry to go away. But I have done my duty now and I will say no more. I must go back, or he will miss me and suspect that I have seen you. Good-bye!” She turned and had disappeared in a few minutes among the scattered boulders, while I, with my soul full of vague fears, pursued my way to Baskerville Hall.